Since the beginning of Anou, the Women’s Cooperative of Khenifra has been one of the site’s top sellers. This is no surprise given that the cooperative’s jewelry, made of traditional djellaba buttons, strikes the perfect blend of contemporary and traditional Moroccan design. Despite their tiny size, the djellaba buttons used to make the jewelry have the potential to make a huge impact on the lives of many women across Morocco. A standard Moroccan djellaba. Djellaba buttons can always be found vertically lined up beneath the djellaba’s collar. Photo credit: Shukrclothing.com, a socially conscious retailer. While the exact origin of the popular djellaba button is unknown, many trace it back to the Jewish communities that used to reside in Fez. The buttons may have originally been used as actual buttons for clothing, but today, they are used as decorative pieces for djellabas, Morocco’s ubiquitous traditional dress. As the demand for djellaba clothing continues, so does the demand for djellaba buttons. Many women in towns across Morocco, most notably in Sefrou and Khenifra, eagerly fulfill the demand to earn any income they can. The process women go through to create djellaba buttons pays little and is time consuming to say the least. 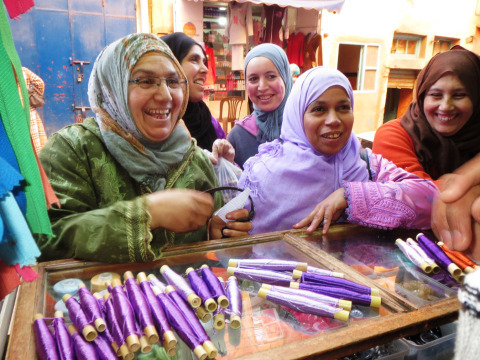 To start the process, the women go to a local store to buy sabra, a thread made from agave plant fiber that is traditionally spun and dyed in Fez. Using a simple needle, the women thread sabra into incredibly intricate buttons. It can take a weaver four to ten+ minutes per button depending on their skill level. Once a weaver completes about 400 buttons — the approximate amount of buttons that can be produced from one 3 dirham ($0.36) spool of sabra — they take it to the local dealer and sell their bundle of buttons for $0.015 per button. (Note: all prices and times listed are approximate as there a numerous buttons with varying complexity and material). Expanding on these numbers provides a glimpse at the income of your typical button maker. For example, it would take a relatively fast weaver (5 minutes per button) a little over 33 hours to complete a bundle of 400 buttons. When the weaver sells a bundle to a local dealer, they’ll earn a total of $6. Push these numbers through fairwageguide.org’s fair wage calculator and puts the wage of such a button weaver 31% below the $2/day poverty line and 88% below Morocco’s minimum wage. In 2007, a Peace Corps Volunteer named Linda Zahava began working with a talented group of button makers in Khenifra in order to find a way for them to earn more for their work. The weavers and Linda experimented and eventually repurposed the djellaba buttons to make jewelry with the belief that it could command a much higher price for the weaver’s work. To say their experiment was a success would be a gross understatement. Since the founding of the cooperative, the women have sold tens of thousands of dollars in jewelry in local and international markets. Their success has even spawned numerous other djellaba button cooperatives and associations across Morocco. Yet over the years the cooperative began running into the ceiling of their potential. As recently as 2012, the cooperative heavily depended on a revolving door Peace Corps Volunteers to facilitate orders from a small group of resellers both domestic and international. Since the resellers held near exclusive access to the popular jewelry via relationships built with volunteers, resellers were able to sell the artisan products to other resellers at prices five times more than the cooperative’s original price. After seeing the high prices their ‘partners’ were able to command for their work, the artisans decided to raise their prices. However, they were quickly met with resistance. Resellers, even fair-trade certified organizations, told the cooperative that by increasing their prices they would be unprofessional and violate the loyalty that they had demonstrated to the cooperative. In addition, the resellers cited that their mark up enabled them to help market the products and provide access to markets the women wouldn’t have otherwise. With no other means to sell their products, the cooperatives only marginally changed their prices. 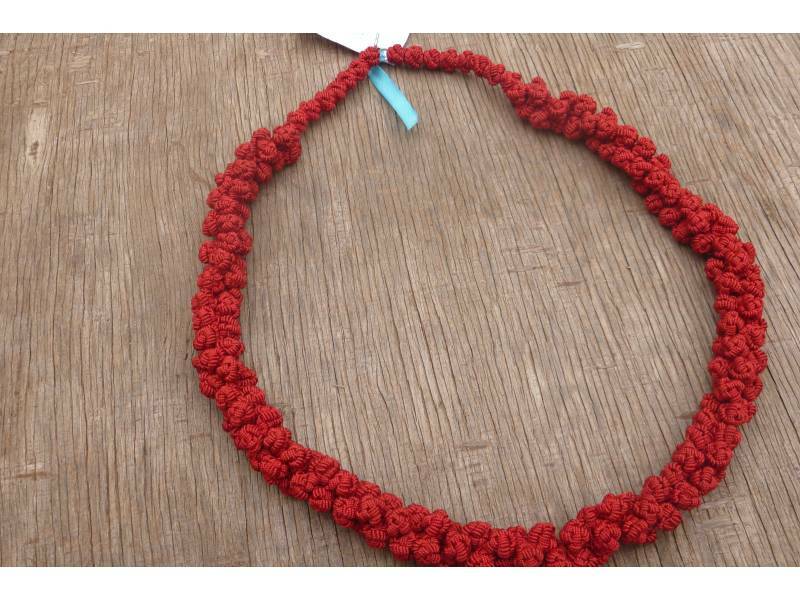 As a result, artisans continued to sell their standard necklaces for $15, while their partners resold the same products for $69 (including shipping). To put such prices in perspective, each $15 necklace takes the cooperative about 21 hours to complete. Pushing these numbers through the fair wage calculator (www.fairwageguide.org), the cooperative earns a wage that is 59% lower than Morocco’s minimum wage and 62% below the recommended fair wage pay. To be clear, the $15 necklaces are resold as fair-trade certified products that are branded with buzzwords such as female empowerment when the artisans aren’t even earning a Moroccan minimum wage, much less a fair wage. When Anou artisans first started talking with members of the cooperative, they expressed that they no longer desired to depend on volunteers to sell their work. Instead, they wanted to sell independently, if not for a better wage, then at least for a more dignified way to sell their products. But they didn’t know how. Anou finally offered them this chance. With Anou’s platform, the potential of the women is now only limited to the amount of work they are willing to invest in their business – not what resellers deem is ‘enough for them to get by’. Over the past several months the cooperative has invested an immense amount of time into their online store by adding a diverse range of products and relentlessly improving their photography. In fact, their photography is improving so much that many consider their photos to be better than the professional organizations that resell their products. Based on the increasing amount of sales they’ve generated on Anou, their hard work is literally starting to pay off. In short, they are beginning to operate as an independent business. Today, the weavers sell their standard necklace for $19 on Anou. Adding in costs of shipping from Morocco, Anou’s 10% fee (and other fees such as credit card fees) you can find the product listed for $36 on Anou. Putting these numbers through the fair wage calculator, and the artisans still have work to do so they can continue to raise their prices. To earn a fair wage, the cooperative will need to increase their prices for $50 on Anou – still cheaper than what fair trade organizations currently sell their work for. If anything, such numbers prove that the only way artisans can actually earn a fair wage is when they do the work themselves. Fair trade organizations today simply manage the entire value chain process in the name of good will, while artisans just provide the labor. As such, artisans don’t just get paid poorly, they don’t gain any skills either. Because of the members of the Women’s Cooperative of Khenifra, the djellaba button has become a source of wealth for many women in Morocco rather than a symbol of their poverty. However, much more work needs to be done in order to ensure that women can gain the full value of each djellaba button they create. With Anou, it is entirely up to the artisans themselves to fully realize the potential of each djellaba button.